Today, while wearing his finest gilded robes and carrying a tremendously heavy gold cross, the Pope criticized the pursuit of wealth and material goods. According to the BBC the Pope said that those who think that “concrete things we can touch are the surest reality” are deceiving themselves. 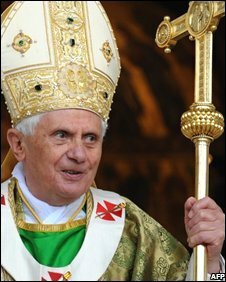 He was then assisted back into his diamond studded wheelchair and rolled by his staff of servants back into the opulent stone and concrete Vatican so he could have his mid-afternoon wallow in the hundreds of billions of dollars pilfered from thousands of years of deluded followers. …superb piece of simple satire. The man and his fascist values, if it weren’t so detrimental to his millions of victims, including weary mothers, guilt ridden teenagers, and terrified children…would be hilarious. The David Yallop Story “In God’s Name” continues to be the favoured piece of journalism when it comes to “outing” the bastards. Even if 75% of the book turned out to be lies…which we seriously doubt… they’re still a pack of right-wing, misogynistic, murdering bastards (did I use that word earlier……..sorry). Feckheads. I think his comments would have a bit less hypocritical if he had followed them with “…and to prove it the Catholic church will no longer accept money from its followers”. Yeah, like he would have ever said that. Free yourself of your possessions … by donating them to US! btw – went to peru to visit a few years back and was horrified to see an Altar made entirely of pure silver (robbed from the Inca and force mined with enslaved labor) It was 5 TONS! Dont forget- the first bishop of Rome, Peter, killed a woman and her husband in cold blood for not donating all the proceeds from the sale of their home to his coffers. This happened soon after the death of the Master (see Acts in the New Testament).